printed in London in the year 1580. This is the story of how two antiquarian booksellers would acquire that particular copy and conclude that it is William Shakespeare’s own personal dictionary. How does one constantly go about finding language that offers fresh ways of depicting characters constrained by the same basic human motivations, circling similar dramatic situations, while playing out their various impulses and desires? No writer ever concerned himself less with the strain of having to do so, nor delighted in the conceit of challenging himself to accomplish more under that principle, than did Shakespeare. 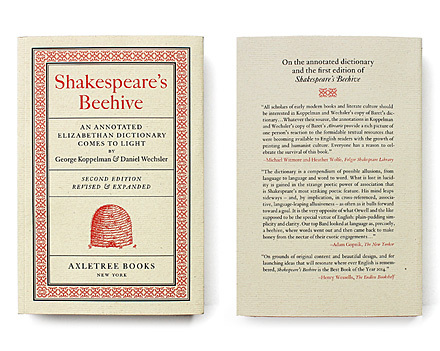 In their newly expanded study of Shakespeare’s Beehive: An Annotated Elizabethan Dictionary Comes to Light, antiquarian booksellers George Koppelman and Daniel Wechsler further their argument that the annotations in their copy of Baret’s Alvearie purchased on eBay belong to William Shakespeare. Using example after example, the authors demonstrate how the annotations and Baret’s text are intricately tied both to Shakespeare’s work and a number of previously speculated details from Shakespeare’s life. Every page of the annotated copy of Baret’s Alvearie is available for viewing to registered members of the Shakespeare’s Beehive community. A sampling of the different types of annotations is provided and defined, along with explanations as to where and how the annotator uses them. 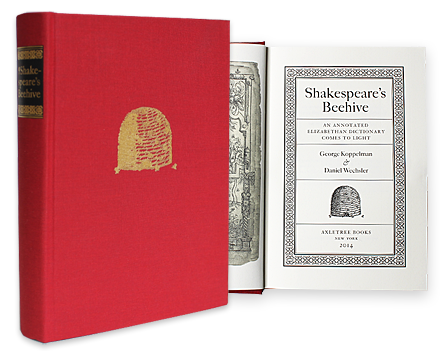 It is highly recommended that the second edition of Shakespeare’s Beehive: An Annotated Elizabethan Dictionary Comes to Light be read as a companion to studying the annotations and considering the possibility of Shakespeare as annotator.